Earlier this month, my family traveled to the United Kingdom to have a mini vacation in London, and then visit family further south in Hampshire. One of my husband’s favorite touring spots is the Portsmouth Historic Dockyard, home to Nelson’s Victory, The Royal Navy Museum, the ironclad ship the Warrior, and the newly designed museum housing the Mary Rose, the Tudor warship that sank in Portsmouth harbor in 1545. The dockyards are a terrific day out, and I highly recommend visiting if you are ever in Portsmouth. I, however, must confess to being a bit tired of visiting the same sites, and this year I asked to be dropped off in Portsmouth and I would walk down to the harbor later. See how unassuming? Dickens’ birthplace is the house with the circular plaque. You see, Portsmouth is home to a couple of literary pilgrimages that I’ve been wanting to make for a very long time. This year, I visited 1 Mile End Terrace, home of the Charles Dickens Birthplace Museum. One Mile End is a small, unassuming Georgian terrace home, on a residential street. So unassuming that according to a museum display, that Dickens himself could not identify the house when he visited Portsmouth as an adult. His strongest memory of Portsmouth seems to be of leaving Portsmouth as a child, with the city covered in snow. The furnishings at Dickens’ birthplace are mostly period furnishings, but not authentic to the time when the Dickens family were renting the house. I really enjoyed the illustration display in one of the bedrooms, showing different artist interpretations of Dickens’ characters. There was also quite a bit of ephemera – a lock of Dickens’ hair, period photographs, playbills, and small personal items. Dickens was so famous during his life, that people saved all sorts of items he owned or touched. There were quite a few checks written by Dickens on display. Apparently, people preferred to keep a check written by the famous Boz rather than cash it! Charles Dickens died on this couch. 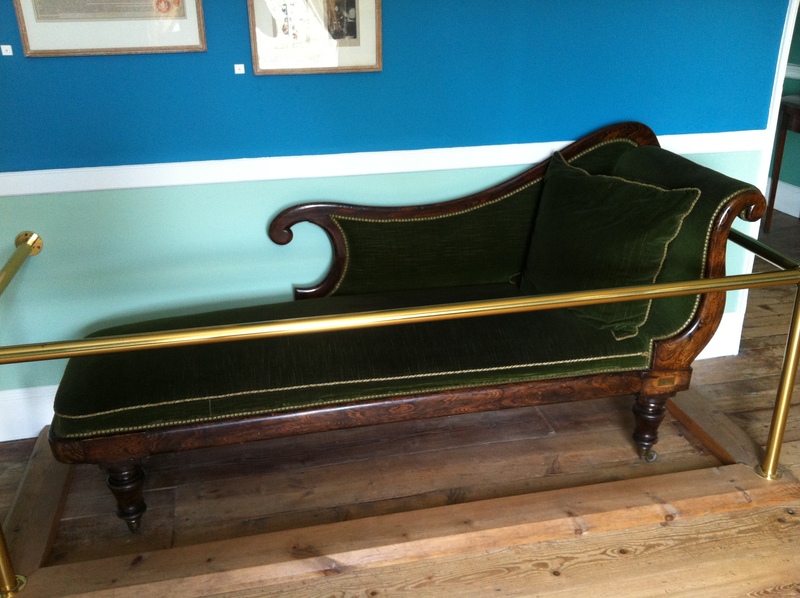 The most important item in museum’s collection is the couch from Dickens’ home Gad’s Hill, upon which he is supposed to have died. It’s possible that he may have died elsewhere – possibly at his mistress Ellen Ternan’s home, and then moved to the couch at Gad’s Hill where his death was reported. 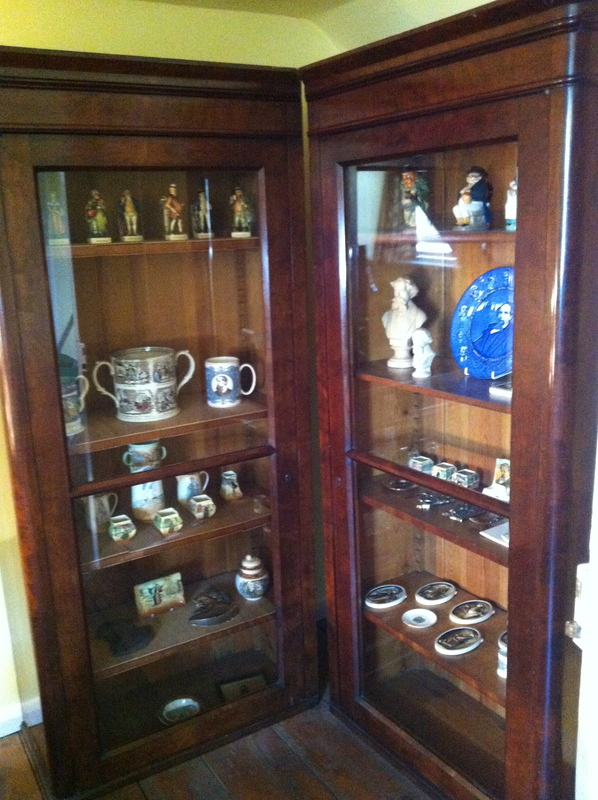 However, my favorite piece in the museum was a pair of bookcases that Dickens owned. It was donated to the museum by a family member, and contained souvenir porcelain, mainly toby jugs, featuring Dickens’ characters. I just loved the bookcases, and I wish I knew what Dickens kept on the shelves. If you are a fan of Charles Dickens, and happen to be in Portsmouth, I would recommend stopping by. It’s a tiny place, and will only take an hour of time to enjoy, even if you linger. It’s probably not enough of a “pilgrimage” to warrant a special trip on its own. However, if you are also a fan of Arthur Conan Doyle, Portsmouth may be worth a stop for you. Doyle spent the early years of his writing career practicing medicine in Southsea. Portsmouth was bequeathed an extraordinary collection of Doyle writings, which is house in a research library called the Arthur Conan Doyle Collection Lancelyn Green Bequest. While the archive is open by appointment only, there’s a permanent exhibition called A Study in Sherlock at the Portsmouth City Museum. Guess where I’m headed the next time the family goes to the dockyard?